"Anytime Is A Good Time To Get Ready For Your WEEKEND Cookouts And B-B-Q's"
You Will Have Immediate Access Of Hundreds Of Recipes For Your WEEKEND Grilling Cookouts Or B-B-Q Needs. . .
You Grill Or B-B-Q With These Recipes On Your Grill. The time is any weekend. What plans do you have? If you are planning a backyard cookout then this is the place for you. I think that you should take advantage of the weekends to celebrate, so mix up some summer time drinks, pop open some beer (or iced tea or some fruit punch drinks, for the non-beer drinkers), light up the grill or smoker, and have a great cookout. Now whether you are going to make steaks, ribs or even hot dogs or hamburgers, make it easy on yourself. Many great barbecue or grilling recipes require time to marinate. You should always prepare as much as you can the day before so you have time to make the fire, mix drinks and socialize. HOWEVER, with this great collection of eBook cookbooks you can cook indoors in your oven, your stovetop, your microwave, in a skillet or other pots or your slow cooker. You can even cook in a dutch oven, if you have one. You are not just limited to grilling or B-B-Q-ing on your outdoors grill. So you can cook B-B-Q or other grilled foods indoors when the weather is to inclimate for cooking outdoors. With the 4th of July right around the corner. These first 10 recipe books will make you the hit of the party with any of these many, many B-B-Q or Grilling recipes. Your family and other party guests will really enjoy the the festive atmosphere of a good ole' B-B-Q or cookout. Impress your family and friends with your new-found 4th of July knowledge, over 200 lip-smacking Independence Day recipes!" Is your idea of BBQ-ing or grilling to light the coals (and hope they stay lit) and throw the food on (hoping it cooks)? Do your steaks turn out either rare or burnt and tough as shoe leather? Then you need to Be A Grillmaster! Covers what you need to know before you can even hope to become a grillmaster. The first step in successful grilling is knowing how to build the fire. This chapter will teach you the different types of fires and how to build them. Now that you know how to build the fire and how to tell what temperature your coals are at, you need to know how to cook the food. This chapter gives you the tips you need on proper cooking. In this chapter you will learn how and when to use these two methods of grilling. Learning the correct way to sear food on the grill will have everyone at your next gathering calling you the "grillmaster"
Teaches you the proper way to add flavor enhancing rubs. Think grilling is a lonely and thankless job. Try making appetizers on the grill and you will have everyone gathering around and complimenting your expertise. From appetizers to desserts, 300 Recipes For The Grill is packed with recipes that will impress your friends and family. Mix or match from the tasty choices in this ebook and you're sure to score winning cheers from a ravenous crowd of avid football fans! Whether it's a back yard barbeque or a more formal party, these great recipes will help put guests in the right mood and let them know you value their company. Start that party planning right now! The Ultimate Chicken Wing Cookbook is the definitive collection of recipes for the chicken wing lover. Filled with easy, addictive recipes that run from classic to exotic, you will discover some of the BEST chicken wing recipes in the world! And Many More! Share the great chicken wing recipes with your family and friends. Impress your friends and colleagues with your new-found beer making knowledge. Over 640 thirst quenching beer recipes! And a grilling or B-B-Q cookout, or anytime is good for chips and dip for that matter, is not complete without chips and dip or salsa of some sort so you will also get the following eBooks. Get salsa recipes for every occasion and every palate. You will get almost 200 salsa recipes for your every imaginable combination of ingredients. Salsa is quickly becoming a "hot" food item as more people discover the South of The Border cuisines. Salsa isn't limited to Mexican cuisine however, as it can include a wide range of ingredients including chile peppers, onions, black beans, tomato, corn, tomatilla, mango, watermelon, peach, strawberry, and a host of others. Dig in and Enjoy!....we're sure to have the salsa recipe you're looking for! In 300 outstanding dip recipes you will find dips for almost every kind of food that you can think about dipping. From ambrosia dip to zesty zucchini dip, there's a dip for every taste and occasion. 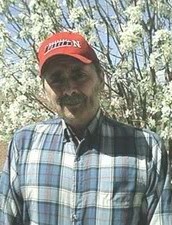 And of course for any grilling or B-B-Q cookout you will need refreshments or something to quench your thirst, so included you will also get the following eBooks. Having a party? Punch is the perfect crowd pleaser. In 400 Refreshing Punch Recipes you will find an easy to make punch for any occasion! Surprise and please your guests with one of the hundreds of tasty, refreshing punches you will find in 400 Refreshing Punch Recipes. Order today and you can be enjoying a glass of ice cold punch soon! These are SPECIALLY hand picked from all the recipe eBooks for your your GRILLING or B-B-Q cookouts! You will receive EVERYTHING listed above as they are included with your purchase of this package! If you love food and beverages, whether you enjoy making them, eating them, or both, there is bound to be a eBook or two or more that you will find here for you. From general interest cooking eBooks to eBooks focusing on everything from beer to chocolate. If you want recipes and lots of them, covering the spectrum from classic American home cooking to dishes from all over the world then this is the place. For example, in The Complete Library of Cooking an outstanding 5 volume set on cooking you'll learn. In the first volume of the set, which deals with the essentials of cooking, cereals, bread, and hot breads. In Essentials of Cooking, Parts 1 and 2, are thoroughly treated the selection, buying, and care of food, as well as other matters that will lead to familiarity with terms used in COOKING and to efficiency in the preparation of food. In Cereals are discussed the production, composition, selection, and care and the cooking and serving of cereals of all kinds. In Bread and Hot Breads are described all the ingredients required for bread, rolls, and hot breads of every kind, the processes and recipes to be followed in making and baking them, the procedure in serving them, and the way in which to care for such foods. And in the fifth volume of the set of The Complete Library Of Cooking, it deals with the varieties of fruits and the desserts that can be made from them, the canning and preserving of foods, the making of confections of every description, beverages and their place in the diet, and every phase of the planning of meals. With fruits becoming less seasonal and more a daily food, an understanding of them is of great value to the cook. In Fruit and Fruit Desserts, you will first learns their place in the diet, their nature, food value, and composition. Then you proceed with the preparation and serving of every variety of fruit. Included in this section also are fruit cocktails, those refreshing appetizers often used to introduce a special meal. I didn't include volumes 2, 3 and 4 for obvious reasons, to save on space. Volume 2 though which is 166 pages pertains to Milk, Butter, and Cheese - Parts 1 and 2, Eggs, and then Vegetables - Parts 1 and 2 completes this volume. Volume 3 which is 169 pages pertains to Soups and Meats - Parts 1 and 2, Poultry and Game, and then Fish and Shell Fish completes this volume. Volume 4 which is 192 pages pertains to Salads and Sandwiches, Cold and Frozen Desserts, Cakes, Cookies, and Puddings - Parts 1 and 2, and then Pastries and Pies completes this volume. Each of the 5 volumes in The Complete Library Of Cooking contains many, many recipes that you can copy or print for easy access for you to use! 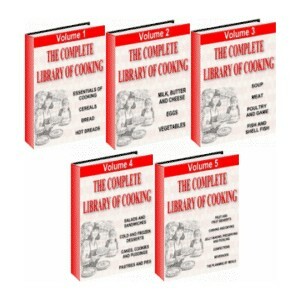 Master the science of cooking with The Complete Library Of Cooking! Learn to prepare meals like the pro's in the comfort of your own kitchen with this outstanding 5 volume set! Check out all the other 64 RECIPE AND COOKING EBOOK products below. There are more than likely at least 2, 3 or more that you would like to have. OR maybe ALL of them. Impress your family and friends with your new-found 4th of July knowledge, over 200 lip-smacking Independence Day recipes! The recipes in the Classic Dessert Collection are the most requested, most popular and most memorable desserts. If you're looking for a cookbook with sure-to-please desserts this one is a winner! Create you own delicious soups from this amazing collection of soup recipes for all occasions and all tastes. All-Time Family Favorite Holiday Recipes is the only recipe collection you will need to plan your memorable holiday menus. From cakes and cookies and breads to jellies and main dishes this one cookbook has it all and you can't go wrong with a recipe that has been a winner in a state fair competition. Amish cooking has become ingrained into traditional American cooking, and this great collection contains 65 of the best traditional amish recipes! With a selection of 150 taste tempting recipes, suitable for any occasion or skill level, from the familiar to the more exotic, the Appetizer Collection opens up endless possibilities and brings together a great range of dinner starters that will help you lead off any dining experience in style. With Deliciously Decadent Cheesecake Recipes, you can easily treat yourself to a delicious homemade slice of heaven or try some of these gourmet cheesecake recipe ideas with friends or family. Are you a chili lover? If you are, then you are going to love 600 Recipes For Chili Lovers! Inside you'll find every imaginable version of chili available! Whether for holiday treats or just to fill the cookie jar, you will find a cookie that will fill the bill. From the old-fashioned, most requested to the newest and easiest bar cookies, this collection has it all! Chocolate Recipes For Chocolate Lovers delivers more than 600 of the best recipes from cookies and cakes to candies and truffles. This eBook is pure chocolate satisfaction for chocolate lovers everywhere! Vegetables are not everyone's favorite dish, but if you dress it up and make it extra tasty you'll find yourself and your loved ones enjoying eating vegetables. 150 Delicious Venison Recipes will enable you to get the best possible taste and the most use from your venison. In 470 Crock Pot Recipes you will find tasty main dishes, side dishes and even deserts that can be prepared in your crock pot in no time at all! Discover how to go from a beginner who likes to cook all the way to head chef of your favorite restaurant! The high cooking temperature of deep frying seals in flavor and texture and seals out extra fat, resulting in juicy, succulent meats, crunchy vegetables, and satisfying breads and desserts. Throw aside that diet book and join the hot craze that is deep-frying! You just can't match the taste and texture of homemade ice cream. This Collection includes 131 Ice Cream Maker recipes that are sure to delight your senses. Jerky makes a delicious snack for the whole family and a great gift for friends. Now you can have the best jerky recipes at your fingertips with 100 Delicious Jerky Recipes! Gift-giving has never been this much fun and so easy. Great Gifts In A Jar is the ultimate resource for inexpensive gifts you can give for any occasion. Sandwiches are great for an easy-going, laid back meal. If you are tired of the same old peanut butter and jelly sandwiches. then Delicious Sandwiches Recipes is the sandwich recipe eBook for you! A Great eBook featuring 111 Egg Recipes and other great resources! Some of the recipes include Omelet a la Washington, Eggs Mirabeau, a la Duchesse, Jardiniere, O'Brien, Lafayette, au Gratin, a l'Aurore and many more! This great recipe book will make you feel like an athlete! You'll have more energy to tackle all those things you have to get done everyday! Getting more done will help you feel better mentally because you feel like you've accomplished so much more each day! Ground Beef is one of America's favorite meats and this ebook contains over 135 amazing ground beef recipes. Recipes your family and friends are sure to love! Smoothies have become very popular over the last few years. In 200 Delicious Smoothie Recipes, you will find smoothie recipes for any time of day and for any meal, including breakfast. Delicious Candy Recipes delivers more than 300 of the best recipes from chocolate and fudge to peanut butter and truffles, this ebook is pure candy satisfaction for candy lovers everywhere! 101 Camping & Outdoor Recipes provides you with 101 delicious, and easy-to-prepare recipes for breakfast, lunch, and dinner that are sure to make you a hit around the campfire. Create your own delicious puddings quickly and easily, by using this great collection of 167 pudding recipes! This really does come highly recommended! Our highly acclaimed, best selling signature cookbook contains 125 pages, 180 hand picked, family tried and tested, real southern recipes. Quick And Easy Cooking is the perfect cookbook to help you prepare great meals without a huge amount of preparation time. Within the pages of Great Sandwiches, you will find recipes for traditional sandwiches as well as a selection of unique variations for all tastes. Now you can enjoy the many, unique flavors of Mexican food in your own home. With Recipes From South Of The Border you will find the finest examples of culinary creativity from this intriguing and vibrant country. Most people don't make seafood a major part of there diets because they believe seafood is boring or they don't like the taste. Now you can have healthy seafood dishes that taste good! Collection of easy to make, delicious orange recipes that your family and friends are sure to love! Create you own delicious italian dishes from this amazing collection of 185+ delicious italian recipes! Collection of easy to make, delicious salad recipes that your family and friends are sure to love! This book contains a huge collection of fish and shell-fish recipes for every occasion. Some of the fish covered are salmon, codfish, sword fish, mullet, mackerel and many more! The Complete Guide To Making Your Own Wine is a complete guide with everything you need to know, including a large selection of recipes, for making your own wine right in your home. Mom's Favorite Family Recipes is a collection of 190 categorized recipes provided to you in an easy to use ebook. This ebook provides over 250 time-tested thanksgiving recipes, that you can cook for thanksgiving, christmas, family reunions, or simply to have fun in your kitchen with your children or relatives. The ultimate cookbook for America's most popular fruit. Mouth-Watering Apple Recipes contains 85 delicious apple recipes for every occasion! These Valentine's Day recipes are a perfect way to celebrate a special relationship or just treat yourself and your family on valentine's day. Delicious Diabetic Recipes gives you an awesome collection of over 500 tasty diabetic recipes, sure to please your taste buds and satisfy your diet restrictions! Breakfast is the most important meal of the day and with Sizzling Breakfast Recipes you get 350 mouth watering, lip smacking recipes! With Delicious Cajun Recipes you get all your favorite cajun and creole recipes. If you like hot and spicy food than delicious cajun recipes is for you! You don't have to what for the fair to come to town to enjoy one of these delicious favorites, Just whip up any mouth-watering fair recipe to bring life to any party. Are you looking for a more natural way to obtain relief for common ailments? Inside this great ebook you will find a wide selection of recipes for herbal teas that will have you feeling better in no time. Contained in these 65 RECIPE AND COOKING EBOOK products are thousaands and thousands of RECIPES. You could copy or print these RECIPES to recipe cards for your RECIPE BOX or you could make a ROLODEX for the recipes by copying or printing them on the rolodex cards. Either one would give you INSTANT access to your recipes! You do not have to waste precious time hunting and searching on the internet for recipes like these. You will have immediate access to these recipes. They will be as far away as your computer for easy access. Or they can be at your finger tips in your RECIPE BOX or on your ROLODEX for the recipes. WHY spend and waste precious time looking and searching for the recipes you want on the spur of the moment when you can have them close at hand? Would Easily Total Several Hundreds Of Dollars (At Least $800 Or More) If Purchased Separately! These Products Have Their Salespages, Thank You Pages, Image Folders and Etc. And You Get The Complete MASTER RESALE RIGHTS To Each Product. That Is Worth Several Hundreds Of Dollars Also. These 65 RECIPE AND COOKING EBOOK products Are Yours To Do With As You Want. You Could Give These Away To Your Friends And Family. They Would Greatly Appreciate Getting These Recipe Collections. OR You Could Sell Them For Profit. You could give them away as presents to your friends or family for their birthdays, Mother's Day, Father's Day, Valentine's Day, Christmas, any other holiday or just whenever you wanted too. Just think of all the people you would make happy. And it would be rather inexpensive GIFTS to give. If You Were To Sell Just 1 Of These You Would Get Your Initial Invest Back Of What You Paid For This And Then You Will Be In PROFIT For Any Others That You Sell!!! Due to the already LOW, LOW price of this collection of 65 recipe cookbooks any type of a Money Back Guarantee is not available. I have lowered the price for a Father's Day and the 4th of July Special. This collection of 65 recipe cookbooks is easily worth at least $97.00 or more since there are 65 cookbooks in this offer. Some cookbooks sell for $39.95, some for $29.95, some for $19.95 and a few for $9.95. So at this LOW, LOW price of $19.97 a Money Back Guarantee is not available. $19.97 is the price of just ONE cookbook. After all you are getting 65 cookbooks for this price. I know this Is A Special Offer. I can't believe how much you are offering me today, at such a low insane price! Note: After making payment with PayPal "DON'T" close the window instead, scroll down to the bottom of the payment page and click on "continue" to go to the download page. E-mail me if you have any problems.